First published in 1997, this short history was an attempt to gather as much of the available information as I could about the two connected villages in Cumbria that I called home for the first 20 years of my life. The book began in the days before the internet was pervasive, and I was living in Alice Springs, NT, Australia at the time. There were endless letters and requests for information to the Cumbria Records Office, Barrow-in-Furness, and other sources. Weeks would go by before roughly photocopied extracts from day books, mine journals and street directories would make their way back to me. 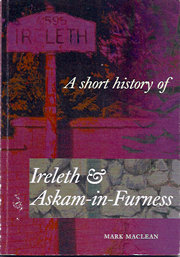 It's long since out of print, but you can download a PDF of the book at the Ireleth and Askam history website. I'm planning a revised edition to celebrate the book's 20th anniversary in 2017. If anyone would like to get involved, contact me by email or through the Askam and Ireleth in Old Photos Facebook page. Find out more about Five Boxes, A Year Down the Drain, The Oldest Man in the Universe Goes to Groovin' the Moo or The New Landscape.